Follow Shane Raymond’s full fitness plan to train, eat, supplement, and look like a British bodybuilding champion. Shane Raymond is a naturally gifted athlete. He is strong and fast, two qualities that have helped him excel at every sport under the sun. Shane put these gifts to use in the British army, but then briefly lost his fitness path. Shane found his way again with heavy weight, consistent training, and a good coach. He now owns the bodybuilding stage and works as a representative for Grenade Nutrition. Follow his complete program to build the body of a British champion. Shane Raymond believes in smart supplementation, so he researches everything he takes. Try his stack and see for yourself. Shane Raymond's training is military-grade. Try his workout program and transform your physique! Ultimate Goal: BNBF/NPA Pro Card and Natural world title. Shane Raymond has always lived a healthy and active lifestyle. At school, he took part in pretty much every sport, including football, rugby, and basketball. He was especially good at the 100-meter dash. "I was district champion twice," Shane says. After leaving school, Shane started to lift weights. He went on to play football for his local team. A few years later, he took up boxing to improve his overall fitness. Shane discovered he was pretty damn good, so he started training seriously to crush his first fight. Even while balling and boxing, Shane continued to lift. "I found that my body responds well to resistance training," he says. "That's when I started to get the most out of my genetics and take my nutrition and training seriously." 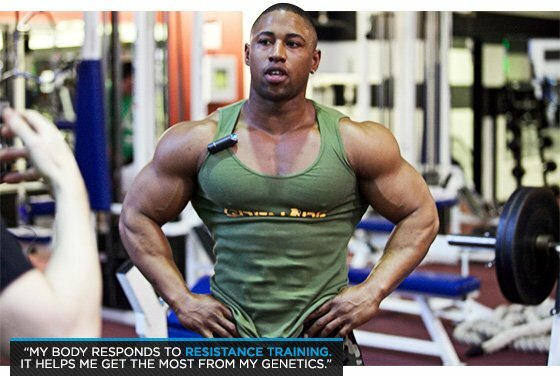 One day in the gym, Shane was approached by a British natural bodybuilding champion. Impressed by Shane's physique, the champ told him to compete. Shane went for it. "With his nutrition coaching, I managed to win a novice title and overall title in my first show," Shane recalls. "I went on to win a British title later on that year." The experience was a revelation. "I found my purpose," Shane says. The following year, he was approached by Grenade Nutrition. Alan Barratt, the CEO of Grenade, invited Shane to the first-ever Grenade photo shoot. "That's when my life changed," Shane says.